Yita bas R' Eliyahu a'h. Sponsored by Hillel & Naomi Herssein. Teach Florida welcomes Ruchie Gross-Berger to the team as Miami-Dade Field Director. Ruchie bring great experience and passion for solving the tuition crisis, building on her experience as Program Director for the JCS Kosher Food Bank. With the new state scholarship program pending before the legislature, it is great to have Ruchie on board to mobilize the Miami-Dade Jewish community. Contact teachflorida@teachcoalition.org to become an advocate. Minyan followed by Siyum Bechorim. 10:47 AM - Latest time for eating chometz. 12:04 PM - Chometz must be burned. 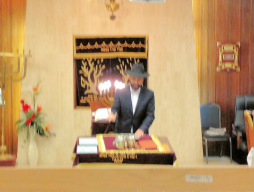 No Shalosh Seudos in shul. We are known as the "Friendliest Shul in Town". A warm and friendly Orthodox shul, featuring two daily Daf Yomi classes.